called St. Patrick’s rock. The main attractions there were drab gray walls and a cemetery. Then headed on to Cork. The bus driver/tour guide was from Cork so he drove us around his city before heading on to Blarney. 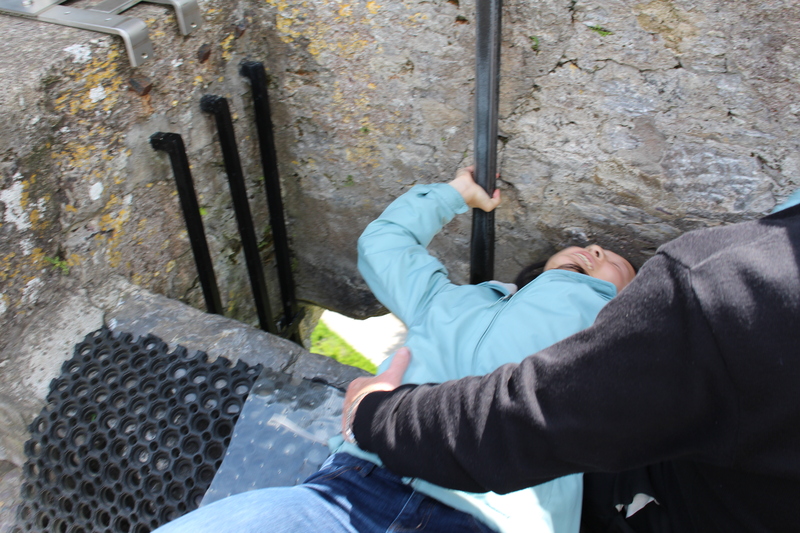 We got there around noon to “beat the crowds,” but there was still an hour long line up Blarney Castle to kiss the Blarney Stone and obtain the “gift of gab”. For those who don’t know, kissing the rock requires lying down and bending the head backwards to while staring at a sheer drop. A man was helping everyone manage the acrobatics and moving people along so fast we barely had enough time to take pictures of each other. One of my friends freaked out at the top and refused to kiss the rock. We visited the poison garden next, which had some poisonous plants like wolfsbane, an important Harry Potter potion ingredient. 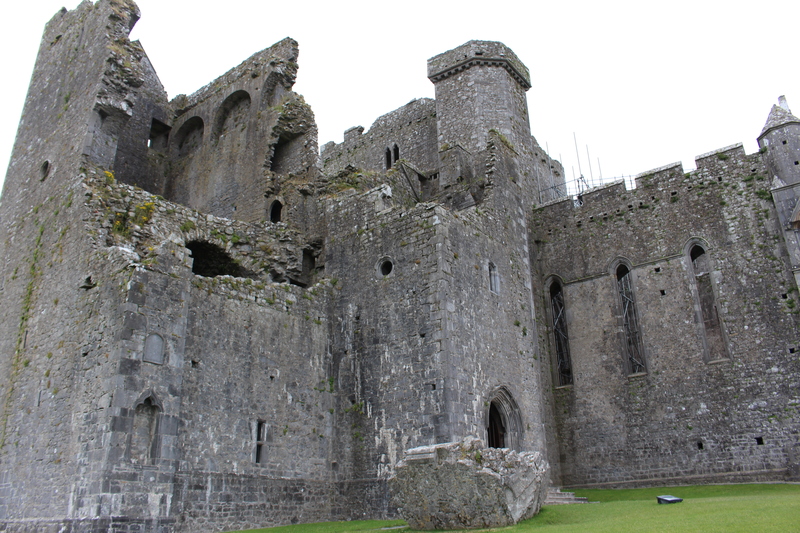 We also took some pictures of the beautiful Blarney House. Our next stop was back at Cork, where we wandered over to the English Market for salmon and cream cheese bagels at a cafe. The rest of the market had an incredible variety of delicious pastries and meats but we barely had time to explore. 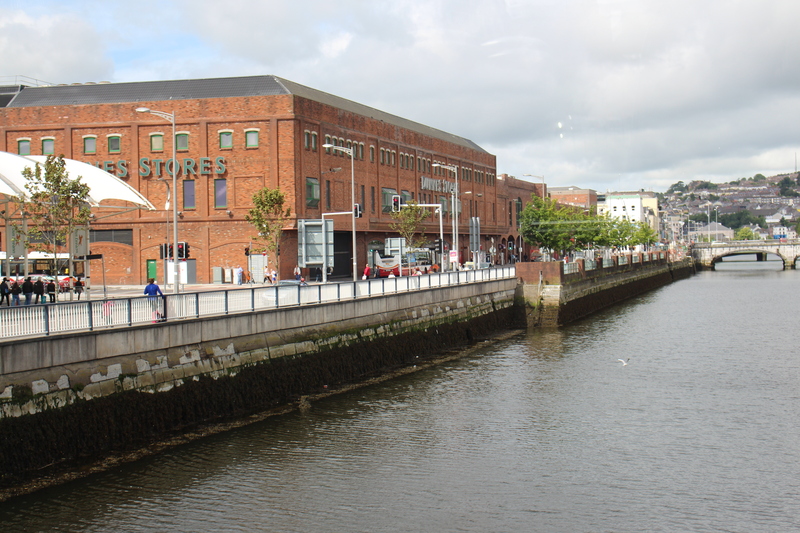 The tour guide said Cork was a more “charming” version of Dublin. was indeed delicious. Got back on the bus and slept all the way back to Dublin. Fun day! Again got up early in the morning with a friend to take a tour bus headed for Belfast and Northern Ireland. After we reached Belfast, I felt torn between a taxi tour of Belfast (history of local conflicts, signing the peace walls) and Titanic Belfast. 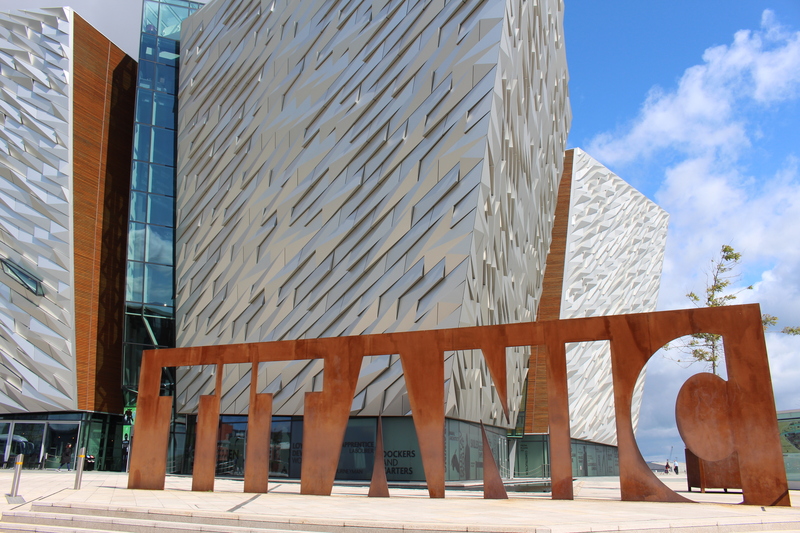 But I chose the Titanic museum because it’s the main reason I wanted to visit Belfast in the first place. I did not regret my decision. The museum was amazing, consisting of many floors of interactive exhibits. The first floor was the story of industrialization in Belfast. Things got real interesting when we took a lift to the fourth floor and “toured” the Titanic shipyard by way of a Disneyland-like ride. There were also replicas of the cabins on board the Titanic. The next floor down displayed a series of final messages transmitted by Titanic as it was sinking. After that were eeire pictures of underwater artifacts from the shipwreck. We had to rush through all the exhibits, but it was still an awesome experience. As a bonus, the Titanic studio, where Game of Thrones is filmed, was just behind Titanic Belfast. On to Giant’s Causeway! 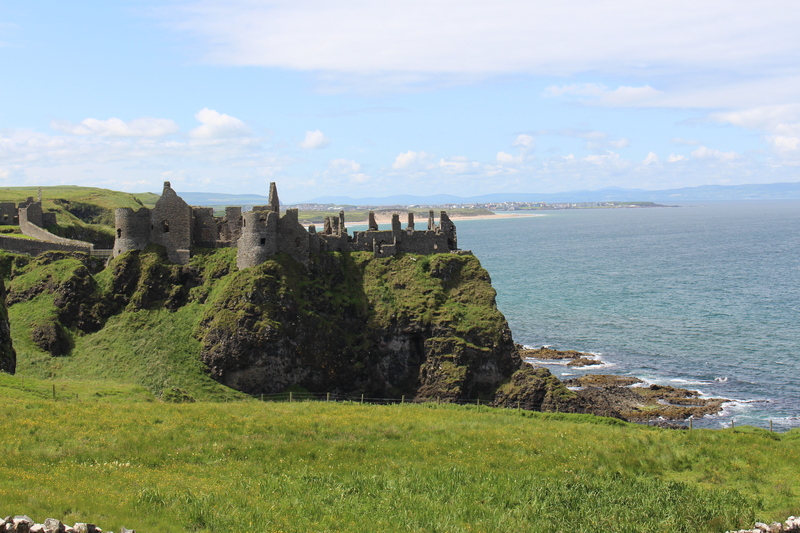 First we stopped by Dun Luce castle, the filming location of House Greyjoy in Game of Thrones. Game of Thrones- House Greyjoy! Apparently Michael Jackson tried to buy that castle. Giant’s Causeway was a bunch of lava-formed rock formations that were wrapped up in myths like the camel rock and the organ and the honeycomb. We had lunch there, and it was super windy. On to the rope bridge at Carrick-A-Rede. There was a line, but I managed to walk really fast and get in the line on time to cross it, take some pictures on the island, and cross back. Some people on our bus didn’t get to go on the bus. That was all for sites, but the tour guide did point out Pyke. Headed back to Dublin, long way there! But got home at 9, just chilling at home. Spent the morning putting together a project. We had our usual pub for lunch, and I tried the steak and Guinness pie. Great stuff. Went for a run on campus in the evening, and that was my day. Kept working on my project and had the same soup and salad at our favorite pub down the street. Went for another run after work but things were kind of sketchy on campus so I headed back early. The morning was pretty tranquil, until we went out for a shoot. 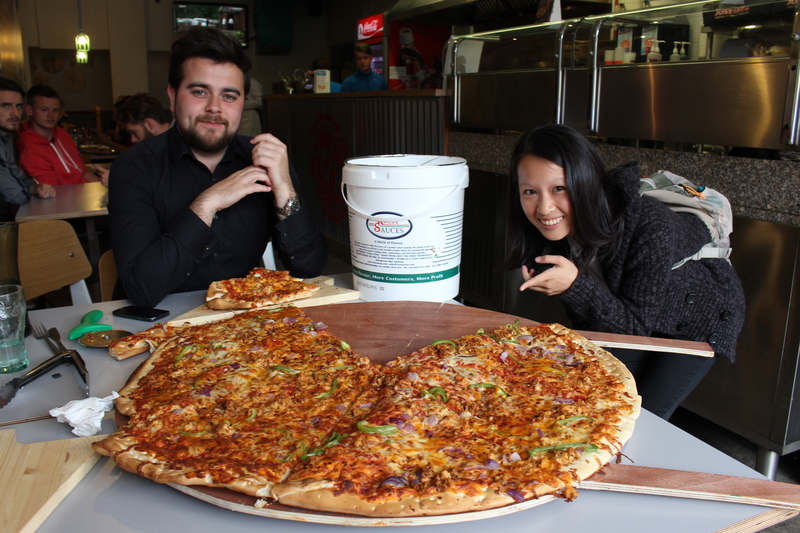 Our editor was taking on the challenge of eating an enormous pizza under 30 min, and we were going to film the whole thing. We got some shots of the chef making the enormous pizza. Then our editor sat down to eat the whole damn thing and only got about two slices in. He had to give up after the 30 min were over and we packed up the remaining slices of the humongous pizza and everyone in the office marveled over it. Sadly, today was my co-intern’s last day and I watched her say goodbye to everyone. I have two weeks left. Now I’m watching TV at home instead of sleeping. We’ll see how that goes when I have to wake up at 3 am the next day.